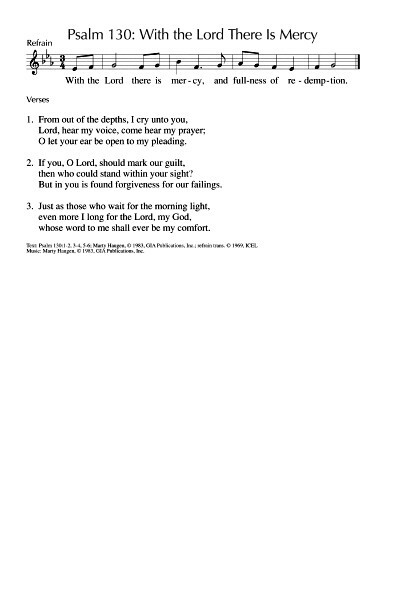 The people want a king as ruler instead of God, even though kings are rotten; This wasn't easy to find songs for - the Psalm below will also fit. Online Resource / Tune In: Kingdom Come (Matthew Lees) A song about what the kingdom might be like, with plentiful images from the parables. Downloadable song book and sound samples. 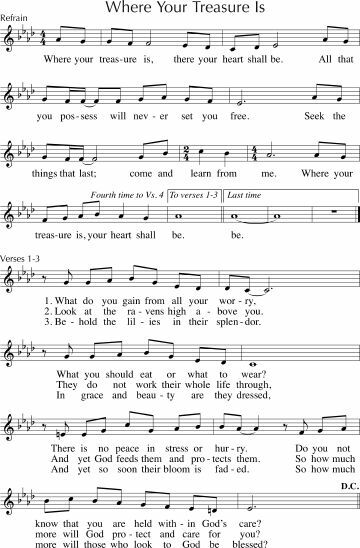 FFS37 In the quiet of the day (Shirley Murray) A simple tune, and beautiful words about moving into a time of worship, and the peace that time apart gives us. *Recorded Music The Garden (Bobby McFerrin) This song is about the Garden, and the Fall, and I think the lyrics fit well for this reading; would be useful to project the words and some images for this? Video and lyrics. AA042 From the apple in the garden (Shirley Erena Murray) If you choose to focus on this reading, this hymn good be a good way to link the story of the Fall with the whole of Salvation History. Lyrics and sheet music. Tune In / Online Resource God is walking in the garden (Dave Brown) A gentle song, and the first verse refers to this reading. Downloadable song book, lyrics & sound samples. Good for older kids. AoV2-070 / ATW 496 / MV090 / StJ Don't be afraid (John Bell) Excellent. I love this song of reassurance. "Don't be afraid, my love is stronger. My love is stronger than your fear". This song can be used as a response to intercessions. Good for kids. FFS62 The Lord God walked in Paradise (Colin Gibson) This tune is quite tricky, but the words are very appropriate for this reading. Lyrics & sheet music. NCH472 / UMH474 / VU670 / R297 / ELW875 / HPP434 / GtG834 / PH404 / G(II)637 / GC874 / GC(II)847 / G(3)955 / CP509 / W&R500 / Cha628 / LUYH465 Precious Lord take my hand (Thomas Dorsey) A classic gospel song. GC(II)647 / G(3)749 / Lau949 Where Your Treasure Is (Marty Haugen) This song is based on this passage, and nearby verses. 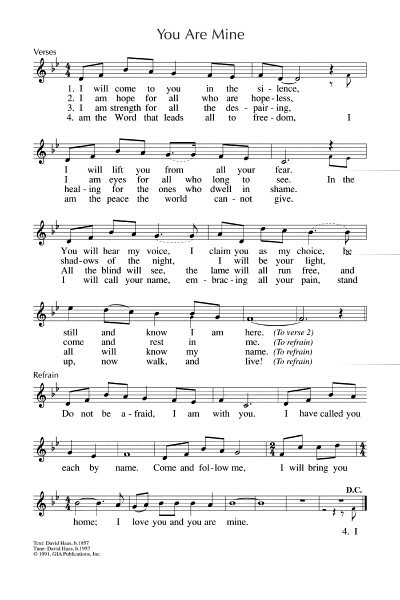 Quite easy to sing, particularly if the congregation only joins in on the chorus. Lyrics and partial sheet music. Sound sample. NCH34 / Iona (SL) / CH138 / SgTJ1065 Nourished by the rainfall the earth can come alive / Flowers of every colour now raise their heads in pride / As the rain is falling / Alabanza (Pablo Fernandez-Badillo) Complex words, but a simple repetitive tune. Inclusive, earthy. Great for a temperate Springtime, or a rainy, greening Winter. There are quite a few different English translations of this Puerto Rican song. 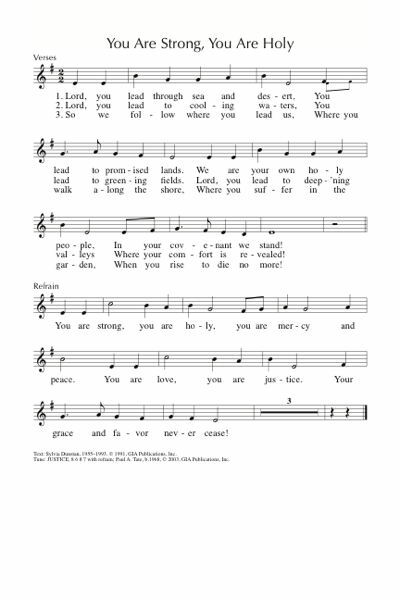 I particularly like the version in Church Hymnary / Hymns of Glory Songs of Praise. midi sample. They think Jesus has gone crazy; he rejects his family, but embraces his new community. *MV178 / AA158 / SFFS 2225 / SP&P215 / W&R602 / Cha486 / ZSS91 Who Is My Mother Who Is My Brother (Shirley Murray) These lyrics are really solid and inspiring. Sources vary widely with the tunes they provide. MV is a swung tune, which will need to be taught, but here are three others from Hope publishing. I quite like the last one (Schrader). Online Resource / ATFG561 / Tune In: Part of a fam'ly interconnected / Community (Dave Brown) A song about being welcomed and how to work together as part of a community. "Part of a family interconnected, this is community; Welcoming strangers, visiting neighbours, this gives us dignity". Very singable song about building community. Works well for kids as well. A big favourite at Brunswick Uniting. Good for kids. Downloadable song book, lyrics & sound samples. Worldmaking.net Brother Jesus right beside me (Richard Bruxvoort-Colligan) This is a great rock song, good for little kids and a favourite of much older kids too. We haven't sung this for a couple of years, and it would be good to do it again. Lyrics and a very silly sound sample that does no justice to the song at all. Good for kids. TiS 650 / ATA 191 / CH694 / A&M604 / NCH539 / VU595 / ELW659 / AA08 / SFFS 2222 / HPP442 / GtG727 / G(II)476 / GC683 / GC(II)661 / G(3)751 / CP500 / CP(E) 393 / W&R391 / Cha490 / SP263 / URW117 / Lau924 Brother, sister, let me serve you / Won't you let me be your servant? (Richard Gillard) I think you all know this one. Lyrics. NCH has a nice turn on the lyrics with "Won't you let me be your servant?" as the first line. That's it from me. If you have any suggestions of your own to make, please add a comment below. For the gospel reading you could use Elizabeth Smith's 'We are the people that God has called'. Number 51 in Songs for a Hopeful Church. ...and God is our father and mother and friend, and Jesus our brother, whose love can't end, and the Spirit has countless blessings to send - this household, the church, means love.